mikeyt.me: My thoughts on Download 2014. My thoughts on Download 2014. Original titles aren’t they? My last blog was about Sonisphere 2014. This one is about Download 2014. From the first announcement, I pretty much had my mind made up that I wasn’t going to do Download. The festival then continued to announce bands that made me sad I wasn’t going. This has happened again today and has made me reconsider my thoughts about not going. Considering I have only discussed 6 of the bands that have been announced, I have a lot of ground to cover. I think the best way to cover this is going day by day. I’ll start with the smaller stages and work my way up to main stage, giving my opinions of the bands that have been announced. Appropriately for a blog of this nature, I will start with day one – Friday. On the Red Bull Live stage on the Friday are bands Huntress, Lyger, Anti-Mortem, Tyketto and Dan Reed Network. Huntress are fairly decent although I thought they had pretty shocking sound when they supported Lamb of God in Southampton. Also, the singer screamed their song titles – not all that helpful when seeing a band for the first time. Lyger have no music on Spotify or their Facebook page so I’m unable to form an opinion about them (I guess I could have looked harder but I opted not to). Anti-Mortem have 2 songs on Spotify and I really like them both - so much so that if I was going for the weekend, I would try and find a way to see them. Tyketto seem fairly decent from what I’ve listened to which honestly isn’t much. I’m not sure I’d go out of my way to see them though. I think I can say the same thing for Dan Reed Network as well. That is all that has been announced so far for that stage and there are probably another 7-8 bands to be announced I’d guess. The first band on the third stage is September Mourning, they sound really quite good. Arcane Roots I’m pretty sure I saw at Reading festival last year and can report back that they are also really good. Radkey seem alright but do fall into the category of if there was nothing else on, I’d go see them. Thy Art Is Murder is not really my cup of tea. I like some death metal/deathcore, but not that. The Amity Affliction sound pretty good. There are a few options for Quicksand online. An educated guess as to which one is playing Download leads me to say that their music contains a nice healthy dose of riffs. However, if it is one of the others, then that is something quite different for Download. When writing this, I thought I had listened to letlive. Turns out this is not the case – for the record they seem really good. Anathema I saw supporting Opeth at the Pyramids in Portsmouth. They were really quite good that night. Speaking of Opeth, they are headlining the third stage. That is a pretty ace 3rd stage headliner it has to be said. Going into the realm of the open air stages now - Danger Danger are the first band on the list and I have to be honest, it surprises me this band aren’t on the same day as Twisted Sister. There is a bit of a glam rock/metal edge to them. Another band who has the same sort of feel is Tesla, who is the next band on the second stage. Both of these bands are pretty cool. The Answer is also on this stage. I used to dislike this band but then out of nowhere (bah gawd) I got them. I’ve seen them twice and they are a great live act. Bury Tomorrow are after The Answer and they are a tad different to anything else that has been announced for that stage. That is not to say they are bad though, I actually quite like what I’ve heard of them. I don’t know if Bury Tomorrow will be 4th from top on that stage, but I’m pretty sure the top 3 bands on second stage will be the top 3 bands by the time June rolls around. These bands are Flogging Molly, Bad Religion and The Offspring. That is just a fantastic run of bands and that alone makes me want to go for the weekend. I just recently saw Flogging Molly who are superb live. I’ve never seen Bad Religion and really want to. Last time I saw The Offspring wasn’t too special but I’d happily give them another go. The main stage I suspect is full for the Friday (as it starts 2 hours later than the other days). Opening the main stage on Friday is Miss May I, a band I was due to see supporting Killswitch Engage recently but was ill during the gig. They seem fairly good. Following them is Crossfaith who were excellent supporting Limp Bizkit recently and I suspect would be even better with better sound. Them playing open air could be interesting though. Powerman 5000 follows them and aside from the one song that most wrestling fans know (Bombshell), I don’t know any of their other material. That said that song alone would convince me to watch them (much like My Own Worst Enemy with Lit). Following them is Skindred who are just ace live. I’d quite happily watch them again. After them though is a band who I don’t have much time for and probably wouldn’t watch – Black Label Society. They just aren’t my cup of tea. After them is one of bands that was announced today which made me curse not having a ticket – Within Temptation. I’ve seen them before (at Download was the first time actually) and they’re great live. I’d certainly try to watch them again (although they could clash with Flogging Molly, which would be tough for me). Then of course, the top two bands are Rob Zombie and headliners Avenged Sevenfold. There would be no chance of me seeing Avenged by the looks of things which would be a shame but I did see them in 2011 so it would not be a big deal. I am finding myself writing as if I’m definitely going to this festival. After today I will certainly be trying to that is for sure. Obviously bands clash with each other at festivals, but if you ignore that fact, there are 19 bands announced so far on the Friday alone I’d happily watch. That is quite a good number! Having concluded the discussions of Friday, it only makes sense to move on to Saturday. There are 8 bands announced for the Red Bull stage so far. Sky Harbour are the “opener” as it stands and they’re quite good. The next band on the list is Coldrain. Now, on Spotify there are two bands with this name and honestly, either of them could be playing Download. Both bands I like the sound of for very different reasons so who knows. There is only one band called New Politics though and they are another one that is quite different. You don’t tend to get much “indie” on the Download bill but this is unmistakably “indie”. I really like it though. Malevolence is a bit different to anything else on this stage but not in a bad way – they are another band who after a brief listen I like what I am hearing. Battlecross were the other band due to support Killswtich Engage. From what I heard, they were quite good. Cage The Gods are another good band. The Howling don’t do an awful lot for me. One of the coups of the festival this year is the return of Sikth. I remember seeing them at Download 2006 and thinking they were really good. Sikth are headlining the 4th stage this year. 9 bands have been announced for the 3rd stage on the Saturday. The first one of these on the list is The Charm The Fury. Having never heard of them before this day, I can say I like what I am hearing. Zoax are the next band up and they’re alright. They don’t do a lot for me but I don’t dislike them. I’ve listened to Upon A Burning Body in preparation for another festival (possibly a previous Download) and didn’t care for them at all. The next band on the list is one called Defeater. This is another band I was convinced I’d listened to before this moment but apparently I was wrong. I like them. Much like I do the next band on the list, Lonely The Brave. I didn’t find anything on Bless The Fall so can pass no comment on them. Black Dahlia Murder are the next ones up and they are not my cup of tea. I heard them at Rock AM Ring 2008 and to be honest, it sounded awful. The next band offers a nice slice of nostalgia. They are American Head Charge and I suspect they would be a lot of fun to watch but there would be a few people in the tent waiting for the song Just So You Know. The headliner of the 3rd stage on Saturday is Behemoth. I still haven’t quite made my mind up on them. I’ve tried to several times and there are times where I’m into what I am listening to but others where I’m really not. The first band on the list for the second stage is a band called Press To Meco. Before today, I had never listened to them. They’re not bad but they do fall into the category of the band I’d watch if there was nothing else on. Bosshoss are fast becoming a regular band at festivals like Download. They are a country band that plays covers of rock and metal songs (not sure if they have their own material – previously when I’ve listened I’ve not looked). They’re an enjoyable band if you need someone to fill a gap. Crazy Town are next on the list and I needed a minute to remind myself who they were (I remembered the name and not much else). They are a classic example of a one hit wonder with their song “Butterfly”. Listening back to that song now, I can see why – this song is quite good. Skid Row is the next band up and they are another good band on the line up. Memphis May Fire is next on the list. I originally wrote that I like them but having heard more of their material, I’m not sure that is accurate. The next two bands on the list are just ace. One I’ve never seen before and one I have. First up is Twisted Sister. I wanted an ace spot for SOAD at Download 2011 and therefore missed them. That is my main regret from that day. If I end up going, I would definitely watch them play. The second stage headliner is Status Quo – the band that headlined the 1982 Monsters of Rock festival at Donington. They have enough hits to make their 60-75min set a fun sing-along the whole time. That would be a lot of fun I suspect. Opening the main stage on the Saturday is the band booked after an online joke. Dying Fetus is a death metal band that I could probably watch and enjoy for a 30 minute set. Much more than that though could be a challenge. After them is a band announced today who I really like, Fozzy. I’m not sure if they’ll have their new album out by then but they’d be good to see again. After them is a band that I find myself unable to make my mind up on, While She Sleeps. They are much like Behemoth for me (not in genre) in that some days I really like them and some days I’m not a fan of what I’m hearing. I wish I could explain that but I can’t. Following While She Sleeps would be a must see band for me who were announced a while ago and that is Bowling For Soup. They are no longer doing tours outside of the US I believe but will come over and play festivals. This is the first one of these festival mini-tours and having never seen them before (aside from hearing them play a Ramones song in 2007); I’d definitely try to catch them. After them is Killswitch Engage who would be another must see for me due to, as mentioned before, I missed their headline show in Southampton as I was ill. Following KSE is Bring Me The Horizon. I’m not a big fan of theirs, and while I do prefer their latest album to any previous work, I’m still not sold on it or them. 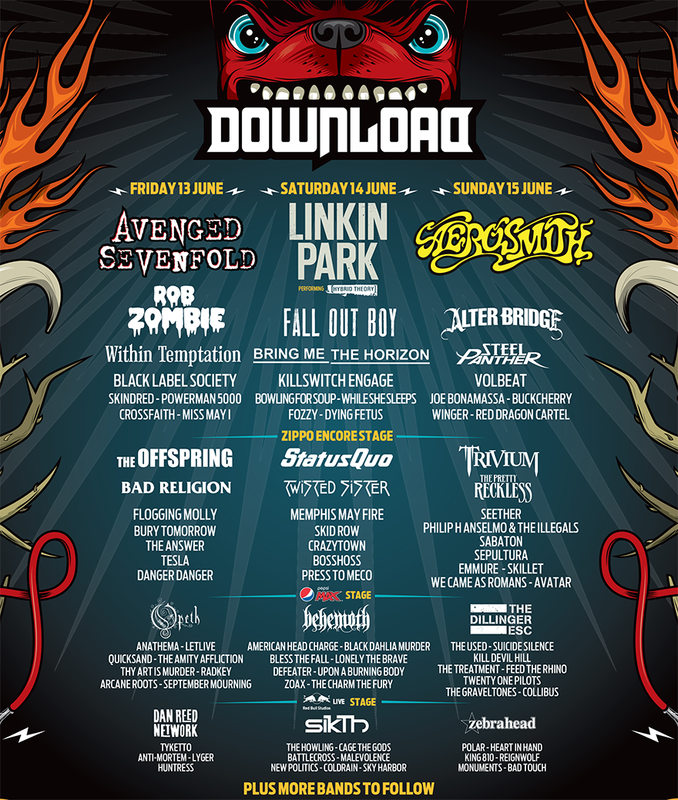 As previously mentioned in my last Download blog, the last two bands after them are Fall Out Boy and Linkin Park. I think I would hope that Linkin Park would play Hybrid Theory early so I could catch some of Status Quo but would have to wait and see what happened really. Again ignoring clashes, I’d quite happily watch over 20 bands on the Saturday. Having covered the first two days, it follows on that the next day to cover is the last day, Sunday. The first band on the list of bands for the 4th stage on the Sunday is a band called Bad Touch. There are two bands that go by this name on Spotify but it is quite apparent (I assume) which one are playing Download. The main thing I got out of this search was getting to listen to The Bloodhound Gang for the first time in a while. Are they still going? Anyway, Monuments are on after Bad Touch and I don’t think they are my sort of thing really. Neither really are the next band, Reignwolf. I couldn’t find any music about King 810 so musically I cannot pass comment on them. On the festival forums there are people on there saying they are awful people who deserve to play to an empty tent. Heart in Hand follows them and they seem to be alright. Polar are a decent band by the sounds of things. The original headliner of this stage has been bumped up the line up (quite significantly actually) so in their place is Zebrahead. I saw them recently and will be seeing them again in a smaller venue; they are a great live band – so much fun! Collibus are the first band on the list of third stage bands, and I’d say they are pretty good. Early morning progressive metal could be interesting on the Sunday. The next band on are The Graveltones and they are great. They’ve gotten a lot of love from the Team Rock people by the sounds of things and for good reason. The songs they have played on Team Rock Radio have been excellent. Twenty One Pilots are next and they are most certainly a different booking. I’m not saying they are bad, because they aren’t. Next up is Feed The Rhino who are a pretty decent band from what I’ve heard. The Treatment follow them and having seen them live a couple of times, I know they are ace live. Kill Devil Hill is a bit of a super-group really but more than that, they are ace! Suicide Silence is on after them and I’m not a fan of theirs. The next band on are The Used and I was of the opinion I didn’t know any of their music. This was proven to be false after choosing one track to listen to! The Taste Of Ink is a song they used to play in an alternative night club I used to go to – and that song is ace. The headliner of the 3rd stage is Dillinger Escape Plan. A band I’ve not heard much by but I do like what I’ve heard. I have to be honest though, if I end up going, I wouldn’t be watching them. The first band on the list for the second stage on the Sunday is a band called Avatar. I really quite like what I’ve heard of their material. After them on the list is a band called We Came As Romans. I haven’t heard much of them and the material I have heard I’ve thought was alright. Skillet is the next band on and they have some good material but their standout song as far as I’m concerned is one called Monster. It is an absolute belter. I can’t claim to like the next band, Emmure. They remind me of Suicide Silence. Having seen the next two bands live at Wacken, I can say without hesitation that they are excellent live - Sepultura and Sabaton. Sabaton were one of the best bands I saw at Wacken 2013 so I would definitely try to catch them at Download 2014 if I went. Phil Anselmo’s solo project outside of Down is the next band on the line up and I’m not a big fan of the album they have released. Seether follow them and while Seether are ace, I do recall them being a bit disappointing supporting 3 Doors Down in Manchester. The Pretty Reckless are next up on the second stage and I’ve never listened to their stuff before now. They sound really quite good! The headliner of the second stage originally was down to headline the 4th stage until common sense prevailed – Trivium is headlining the second stage. They are a great band but I wouldn’t be watching them because they’d clash with the main stage headliner, Aerosmith. Red Dragon Cartel is the first band on the list for main stage bands on the Sunday and they’re an ace band so I’ve no problem with that. Winger are next on the main stage and they strike me as a poor man’s Bon Jovi. Their material is decent enough I guess. After them is one of the bands who pulled out of Download 2013 – Buckcherry. They are a great live band and an excellent addition to the Download bill. Joe Bonamassa follows Buckcherry and his material seems alright. He most certainly is an excellent guitarist. Following him is one of my favourite bands and a repeat booking from Download 2013 –Volbeat. They are excellent live. Hopefully this time around they’d have a longer set and a bigger crowd as there will be no ridiculous clash this time! After them is the comedy metal act, Steel Panther. They have some decent material and I’ve only seen them perform one song live so if I went, I guess I could watch them. It would really depend who else is on I suppose. Following them are the two bands I discussed in the headliner blog, Alter Bridge and Aerosmith. Aerosmith without doubt would be the biggest must-see band on the line up (well for me anyway). Again if we were to ignore clashes, there are over 20 bands on the Sunday I would happily watch. Over the course of the weekend, Download has a ridiculously good line up. That is something I honestly didn’t think I’d be able to say after the first announcement and one of the reasons I wrote off going. I am now in planning stages trying to work out if I can make it, and if so, how I can make it. I’m not sure if it is at all possible, but I will try to make it happen. In one blog I said roll on Sonisphere, but it would seem that plan has changed dramatically – roll on Download (hopefully)!